On Friday attorneys for the Diocese and Corporation received notice that the Texas Supreme Court is requesting briefs “on the merits” in our appeal. While our Petition for Review remains “under consideration” by the Court, this is very good news, signaling that the Court wishes to take a closer look at the April 2018 decision of the Second Court of Appeals. This is often the next step before the Court grants a Petition for Review. The letter sets a date of March 11* for our legal team to file our brief. Following that, the Court is asking the TEC parties to respond by April 1, after which the Diocese will make a closing reply by April 16. Once these briefings are complete, we hope to hear that the Court has accepted our Petition for Review and the appeal is moving forward. Please continue to pray for the Court and for our attorneys as they prepare the March 11 filing. We thank God for His blessings and put our trust in His plans. *This date was later moved to April 10. On Friday, Nov. 2, attorneys for the Diocese and Corporation filed a response to the October reply by TEC parties to our Petition to the Texas Supreme Court for a review of the Appellate Court's opinion, issued in April. A reply to the cross petition is due next month. On Wednesday afternoon, Oct. 3, Episcopal Church parties filed in the Supreme Court of Texas a Response to our Petition for Review, as well as a Cross-Petition for Review, concerning rulings by the Court of Appeals that were adverse to the TEC parties. Both documents are linked below. Our legal team is studying these filings, and appropriate responses will be made and presented to the Court. The Diocese of Fort Worth and its Corporation took the next step today in defense of our church property against the hostile claims of parties representing The Episcopal Church (TEC). Attorneys for the Diocese have filed a Petition for Review with the Texas Supreme Court regarding the April 2018 opinion released by the state’s Second Court of Appeals in Fort Worth, which relied on old Deference standards to reverse the trial court’s 2015 Summary Judgment ruling. Recognizing that our times are in God’s hands and that the blessings of this life come from Him alone, we continue to pray for the wisdom of the courts and the conclusion of this dispute. 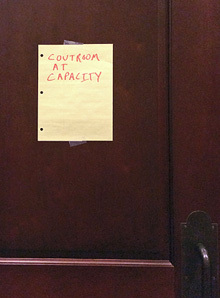 Visitors’ seating was full today in the Second Court of Appeals in Fort Worth as a three-justice panel heard arguments from both sides regarding the appeal of last year’s trial court ruling in favor of the Diocese and Corporation. Justice Ann Gardner welcomed all those present for the hearing, noting the unusual number of observers. The appeal was filed by the plaintiff Episcopal Church parties after the trial court ruled that, under neutral principles of law, the church and diocesan properties held by our Corporation are held in trust for the Diocese and not The Episcopal Church. The Texas Supreme Court ruled in 2013 that the trial court should apply neutral principles rather than deferring to TEC wishes. It also declared that the Dennis Canon has no force or effect in the state. Attorney Scott Brister answer several questions from Justices Lee Gabriel, Bonnie Sudderth, and Gardner during his presentation on behalf of the Diocese and Corporation. The hearing concluded on time. There is no period defined for the court’s response, but a ruling can be expected within a few months’ time. Attorneys for the Diocese and Corporation ask for continued prayer for the justices as they review the extensive record in the case and reach a decision on the appeal.